A treasure you’ll find at the Milwaukee Art Museum: One of the oldest known pieces of American furniture to survive. Let me say that again: At the Museum is one of the oldest known pieces of American furniture. 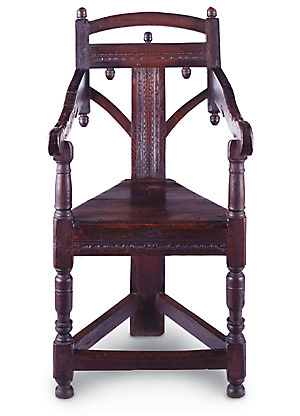 This dramatic chair was made sometime in the mid-1600s in Connecticut or Massachusetts. Of course, at the time of its construction, its maker would have identified himself and the style of this chair as English. And yes, three-legged chairs of this type were not uncommon in England, but on the faraway shores of New England, this Great Chair was a great novelty. I love this wacky chair. It has a bold three-legged shape, stylish turned elements, and chip carving along its arms. Its survival, stature, and detailed ornament mark it as an exceptionally important piece of furniture in the period. It is from a time and place (early Colonial New England) when just the very fact of having a chair was exceptional. Most people sat on simple benches or stools, and only the patriarch of a wealthy family would have had access to a status symbol such as this Great Chair. The chair is made of white oak, red oak, cherry, and ash, but the effect of the wood may have been amplified by black and red paint. Detail of the Stanley-Whitman House, (Farmington, CT), 1720. Image from Boston College Prof. Jeffery Howe, Digital Archive of American Architecture. The possible maker, John Elderkin, a house carpenter who came to America in 1637, may have based it on his knowledge of architectural building techniques. We see above drop finials on a 1720s Connecticut home that reflect the architectural styles popular in the 17th century. 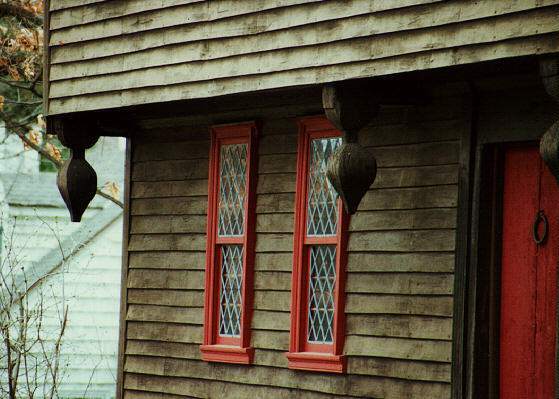 Below are similar drop finials on the 1683 Parson Capen House in Topfield, Massachusetts. The ornamental drops and finials on the Great Chair match this bold decoration very closely. 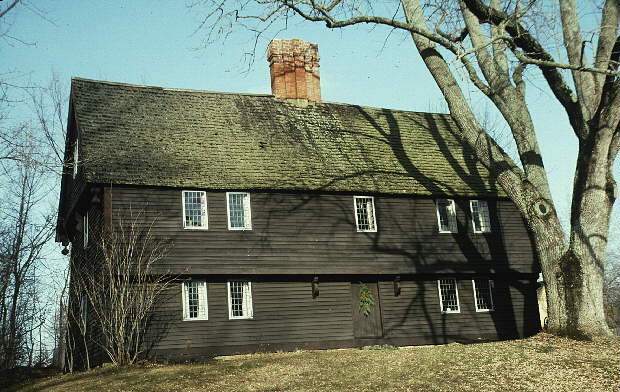 Parson Capen House (Topsfield, MA), 1683. Image from Boston College Prof. Jeffery Howe, Digital Archive of American Architecture. 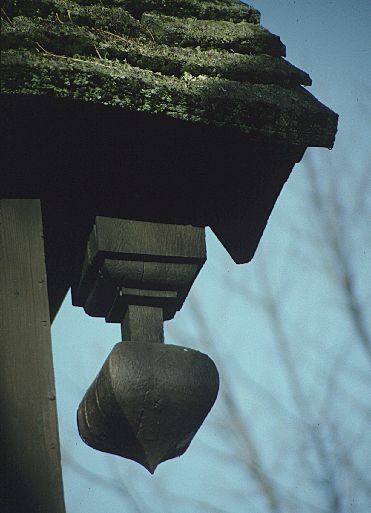 Drop finial detail from Parson Capen House (Topsfield, MA), 1683. Image from Boston College Prof. Jeffery Howe, Digital Archive of American Architecture. The Great Chair is owned by the Milwaukee-based Chipstone Foundation and is on view in the Decorative Arts Gallery on the Milwaukee Art Museum’s Lower Level. This entry was posted in Art, Curatorial and tagged 17th Century Art, American Art, architecture, Chipstone Foundation, Decorative Arts, From the Collection, Furniture, John Elderkin. Bookmark the permalink. Thanks for the opportunity to view this piece. I’ve seen other similar Dutch and Irish chairs but none as unique as this.